March 2, 2012: Glowing green and red, shimmering hypnotically across the night sky, the aurora borealis is a wonder to behold. Longtime sky watchers say it is the greatest show on Earth. 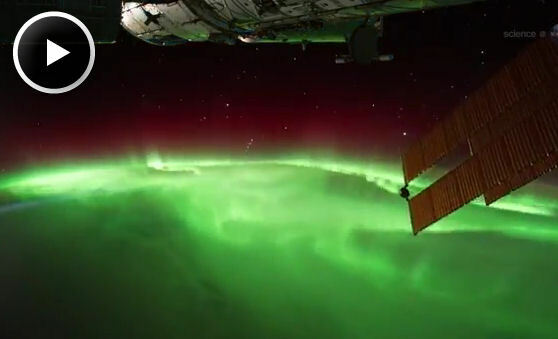 Lately, the International Space Station has been flying through geomagnetic storms, giving astronauts an close-up view of the aurora borealis just outside their windows: video. Auroras are caused by solar activity. Gusts of solar wind and coronal mass ejections strike Earth’s magnetic field, rattling our planet’s protective shell of magnetism. This causes charged particles to rain down over the poles, lighting up the atmosphere where they hit. The physics is akin to what happens in the picture tube of a color TV. Incoming particles are guided by Earth’s magnetic field to a pair of doughnut-shaped regions called “auroral ovals.” There’s one around the North Pole and one around the South. Sometimes, when solar activity is high, the ovals expand, and the space station orbits right through them. Pettit is a skilled astrophotographer. He and other members of the crew video-recorded the displays, producing footage that officials say is some of the best-ever taken from Earth orbit. The videos capture the full range of aurora colors—red, green, and many shades of purple. These hues correspond to different quantum transitions in excited atoms of oxygen and nitrogen. The precise color at any altitude depends on the temperature and density of the local atmosphere. 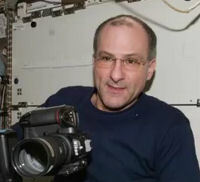 Astronaut Don Pettit is a prolific photographer and writer. More of Don's experiences onboard the ISS are recounted in his online blog. What he does find disorienting is the meteors. As marvelous as these sights are, Petit has seen better. He was the science officer for ISS expedition 6 back in 2003 when the auroras were even stronger than they were now. “But this expedition is not over yet,” he points out hopefully. Indeed, more auroras are in the offing. Following some recent years of deep quiet, the sun is waking up again. Solar activity is now trending upward with a maximum expected in early 2013. This means the greatest show on Earth—and in Earth orbit—is about to get even better. Stay tuned for updates.